Brass jags perform well for their intended purpose — with one hitch. Strong copper solvents can actually leech metal from the jag itself, leaving the tell-tale blue tint on your patches. This “false positive” can be frustrating, and may lead shooters to over-clean their barrels. 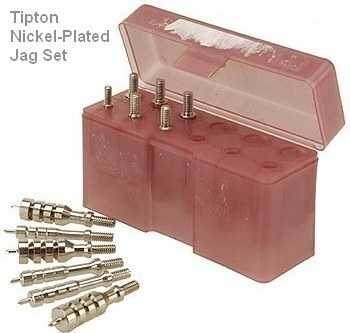 If you prefer a metal jag, MidwayUSA sells Tipton Nickel-coated jags, both individually and as a boxed set. The vast majority of user reviews have been very positive. A few guys have complained that the nickel-plated Tipton jags run oversize, but we use a .22-caliber jag in our 6mms anyway, so this hasn’t been a problem for us. The 22-caliber nickel-plated jag (item 996840) costs $4.79. 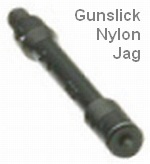 The complete 12-jag set (item 812503), covering .17 to .45 calibers, costs $24.49 including a fitted box, shown below. K&M Tools offers stainless spire-point jags in .22, .243, and .308 calibers. These are well-made and won’t produce false positives. However, with stainless jags, you MUST always keep the jag covered with a patch when inside the barrel. Otherwise you can rub steel against steel — not good. The downside of stainless is the potential for barrel scratching. On the other hand, according to Forum member Dans40x: “300 series stainless steel jags last a few lifetimes”. If you’re reluctant to give up your collection of brass jags (after all they’ve worked pretty well so far), try covering the jag itself with a thin, transparent coating. Forum Member BillPA says: “I give the brass jags a coat of clear lacquer or acrylic; that works for me”. You may need to experiment to find a coating that stands up to your favorite solvent. BillPA says: “The only solvent I’ve found that eats the lacquer off is TM Solution. Butch’s, Shooter’s Choice, or Wipe-Out don’t seem to bother it. Most of the time I use rattle-can clear lacquer”. If you’re feeling creative, you could even color-code your jags by adding tints to the clear-coat. Share the post "Brass Jag Alternatives: Nylon, Nickel, SS, Clear-Coated"
I’ve found that the nickel-plated Tipton .30 cal jag works fine in my bolt-action .308s, esp. with 2″ round patches. However, it is too tight for my M1 barrel and I’ve had to use a .270 jag for that rifle. I’ve noticed that after a couple years now the Tipton is starting to wear off the nickel a bit. I just ordered a new one but will probably add some nylon jags to my collection. Depending on how it’s applied, nickel plating can be used as a hard, wear-resistant surface, and might not be the best choice for rifle bores…. Couldn’t find any links to the K&M stainless jags. Who sells them and do they fit Pro Shot stainless rods?